Sometimes I just love the surprises that the children give (of cos the pleasant ones). 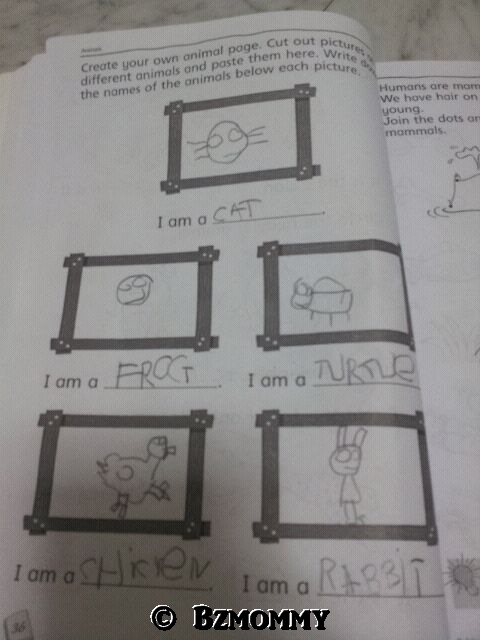 Don’t you like the chicken, the rabbit, the turtle, the cat and the frog head? I am really so proud of her! She used to be so afraid to draw because of the “afraid of wrong” and the “don’t know how to” reasons. It was really difficult to make her to write or draw and we had to encourage her alot. Her school teachers had to teach her to discover on drawing and writing, and I am really glad that she is so confident now. And she sure can draw better than me! I can’t even draw a chicken! This entry was posted in Bzmommyhood, Dawn and tagged Dawn, Drawings. ← Steps on her own!